3d-io has just released UV-Packer 2.0, with new features and improvements, as well as compatibility to Autodesk 3ds Max. What is new in UV-Packer 2? 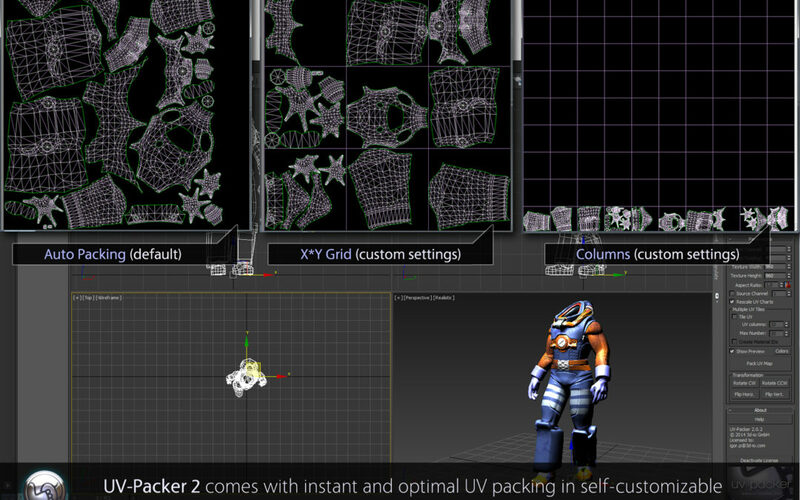 – UV-Packer 2 offers 3D Artists instant and optimal UV packing in self-customizable UV tile sets. Artists can now easily control the number of UV tiles, automatically generate material IDs for each UV tile or unwrap the UV tiles according to material ID settings. This is especially useful for Mari, Mudbox or ZBrush workflow. – Compatibility with Autodesk 3ds Max 2015. UV-Packer 2 comes out with the new online managed licensing system, allowing users to transfer licenses with one click to any other workstation. No more waiting time caused due to time-zones or email requests: you can activate or deactivate the license and move it as you wish. UV-Packer represents the perfection of simplicity and performance for uv map packing: it is a single click solution for packing all UV-Parts of your object in the best possible way. You no longer need to spend hours moving, rotating and scaling your maps in order to utilize the whole mapping area – UV-Packer does it for you in a second. In a vibrant and stressy job of a modern 3D artist there is nothing worse then losing time on repetitive and boring manual works. Just imagine how many more crazy artworks and awesome designs you could design if there were no such things like dragging, rotating and adjusting parameters which should be actually done by the machine. The designers and developers of 3d-io offer you herewith a small yet fast and exact utility to save hours and days of your work on UV Maps. UV-Packer does what you can’t: it calculates the perfect quadrature of your maps, scales them and put the pieces together in mathematically exact way no human would ever be able to process. UV-Packer not only moves and rotates your UV parts, it also takes the mesh surface area into account and scales the parts independently to provide a uniform pixel distribution. Your models will never again have different texture sizes and therefore varying amounts of texture quality on legs, arms and body textures, since UV-Packer keeps them all even.